Regular visitors to this blog will know all about The Wonderful World of Albert Kahn, the BBC television series which highlighted the astonishing collection of Autochrome photographs and motion picture records of life around the world in the early years of the twentieth century, created by French millionaire philanthropist Albert Kahn. You may also know that there has been immense frustration for the many fans of the series that no DVD release has been made available, supposdly for licensing reasons, except for a colossally expensive version intended for the educational market. Now prayers have been answered. The series has made it to DVD. The Wonderful World of Albert Kahn has been released by 2 entertain (the video distributor part-owned by BBC Worldwide). The 3-disc DVD set (PAL, region 2) is in nine episodes, running 462 mins (500 mins says the BBC shop). The series shows beautifully-composed scenes from around the world: China, Brazil, the United States, Ireland, France, Mongolia, Norway, Vietnam and much more, from the mid-1900s, through the First World War and into the 1920s. 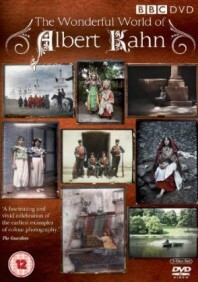 Kahn’s team of photographers chiefly took still photographs, using the complex Autochrome process (invented by the Lumière brothers) with its hauntingly beautiful results, but they produced monochrome motion picture records as well, capturing distant lands and cultures on the brink of disappearing into history, and unconstrained by the need to convert the material into form that would be acceptable to the commercial cinema. It’s unclear to what degree the DVD represents the original BBC series, which was shown in nine one-hour parts, the first five broadcast on BBC4 on April 2007 under the title The Edwardians in Colour (subtitled The Wonderful World of Albert Kahn); the remaining four as The Twenties in Colour in November 2007. The BBC Active educational version is 9×50 mins. Amazon and the BBC Shop site say that there are ten parts, but the British Board of Film Classification registers the release as being in nine parts, and this seems more likely. Anyway, the DVD set is now available, having been released on 7 September. If you want to find out more about Kahn and his Archives de la Planète project, visit the Searching for Albert Kahn post on this blog.